How quality is assessed in objective and subjective ways. How the different quality parameters are measured. Orange juice categories and the terms used to describe the various types of orange juice. An introduction to regulations governing juice quality. The most important elements that influence orange juice quality are sugars and acids, flavour and colour, and vitamin C. Along with cloud, these elements are analysed to define and grade juice. The °Brix scale is used to measure sugar concentration, and juice acidity is measured by titration. There are several methods for measuring cloud and colour. Flavour is evaluated using subjective methods and is thus difficult to define and measure. Deterioration in juice quality is a consequence mainly of flavour degradation, non-enzymatic browning and nutrient loss. Enzyme activity affects the mouthfeel of juice, and the formation of limonin makes juice taste bitter. Many special terms are used for the two main categories of orange juice products: ready-to-drink orange juice and juice concentrate. Some of these terms are referred to in national regulations, other terms are merely used in juice marketing and trading. Standards and regulations governing product origin, juice processing, juice quality and product labelling are implemented by a number of regulatory bodies in different trading blocs. There is a general desire worldwide to harmonize the standards in force. However, because orange juice is traded and consumed worldwide, its quality cannot be determined solely by subjective assessments. To make evaluations more objective, several quality parameters have been defined. Some are used to classify (grade) orange juice, while others are used to specify the product for trading. Table 2.1 lists the important quality parameters for orange juice. All the parameters in Table 2.1 except flavour can be determined by standard methods of analysis to give meaningful and reliable results. Orange juice flavour can only be evaluated by sensory means, usually by groups of panellists. These analysis methods have been published in books by, for example, Redd et al. and Kimball. The basic quality of orange juice is determined at the fruit processor by the quality of fruit accepted at the reception area, fruit storage times and the way juice is extracted. Subsequent processing steps cannot improve the main quality parameters of a given production batch. Improvements can only be achieved by blending a particular juice with superior quality orange juice or concentrate. This is commonly done. All processing and storage of juice on its way to the consumer should aim at maintaining the initial quality as much as possible. Equally important is the quality of water used to reconstitute orange juice, as juice made from concentrate comprises 85% added water. The effects of processing on quality are mainly related to flavour degradation, while non-optimal storage conditions can result in juice browning, loss of vitamin C and flavour changes. Guidelines for quality standards for fruit juices in the European Union are specified in the Code of Practice for the evaluation of fruit and vegetable juices, published by the AIJN (see Section 11). The absolute quality requirements defined in the reference guideline for orange juice are given in Table 2.2. In the US, the Department of Agriculture (USDA) is responsible for specifying quality standards for orange juice. To be labelled USDA Grade A, orange juice produced in Florida must meet the quality requirements shown in Table 2.3. These are measured on a 100-point scale. If the total score is above the baseline but just one of the quality factors does not meet the Grade A requirements, the juice cannot be labelled Grade A. The key properties of orange juice that are directly related to these quality parameters are discussed in the subsections. The most important properties of orange juice are its sugar content and ratio of sugar to acid content. This ratio indicates the balance between sweetness and acidity in the juice. When the fruit matures, the ratio increases as sugars are formed and the acid content decreases. The sugars are mainly sucrose, glucose and fructose in a ratio approximating to 2:1:1. The sugar content of juice is normally expressed as °Brix. In extracted juice, the concentration of sugar typically varies from 9 °Brix for early season varieties to 12 °Brix for fruit harvested late in the season (for example in Florida). The °Brix (degree Brix) scale, which was developed by the sugar industry, relates the sucrose concentration of a pure sucrose solution to its density at 20°C. °Brix for orange juice not only includes the concentration of dissolved sugars but all soluble solids. Dissolved substances other than sugars will influence the result of °Brix measurements. Thus, the level of acid, the second most abundant dissolved material, is often measured and a correction of the Brix value is made. For single-strength orange juice, acid correction is small and the term °Brix is commonly used without correction to mean only the sugar content. However, in measuring °Brix of orange juice concentrate, the acid correction is important due to the much higher acid content of concentrate. Here, the term “°Brix, corrected” is used. In the laboratory, the °Brix of orange juice is analysed by measuring the juice density with a hydrometer or by measuring the refractive index of juice using a laboratory or hand refractometer. Two basic instruments used for Brix analysis are shown in Figure 2.1. Read more about in-line measurements in subsection 7.4. Examples of instruments used for Brix measurements. After sugars, acids are the most abundant class of soluble solids in orange juice. They comprise mainly citric acid and, to a lesser degree, malic acid. Some of the acids are in the form of salts, which give orange juice a buffering capacity. Hence, even though the acid content may vary widely, the pH of juice extracted from mature oranges is generally between 3.2 and 3.8. Brix can be measured by either density measurements or by measuring the refractive index of orange juice. Both are then related to a 100% sucrose solution. The °Brix scale is based on standard measurements at 20°C. If the juice/ concentrate is analyzed at any other temperature, a correction factor is used to equate the °Brix measurement to one made at 20°C. To obtain the corrected °Brix figure, the acid content must be determined by titration in order to read the right correction figure from a table. The buoyancy of a hydrometer in a liquid is directly proportional to the density of the solution. Therefore a scale on the neck of the hydrometer can be calibrated to a °Brix scale. The °Brix is read on the scale at the point where the liquid meniscus intersects the hydrometer neck. Before measuring it is important to deaerate the juice since air in the sample can affect the result. Hydrometers are mostly used for singlestrength juice. Although a hydrometer is an inexpensive instrument, it is not very fast and requires up to 200 ml of sample. For in-line Brix measurements, one common method of measuring density is to feed the sample through an oscillating tube. When the liquid enters the tube, the frequency of the oscillations decrease. From this deviation the density can be calculated. Read more about inline density measurements in subsection 7.4.8. Light travels at different speeds in different media such as air, water or sugar solutions. When light passes from one medium to another it is refracted – that is, it changes direction slightly. This property of a medium can be quantified as its refractive index. The refractive index of a solution depends on its total soluble solids. Therefore °Brix can be determined by measuring the refraction of light. 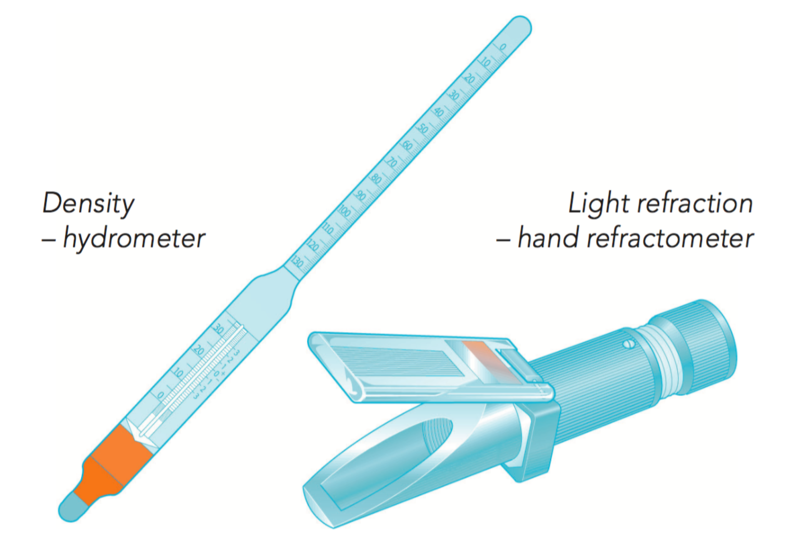 Either analogue or digital refractometers can be used to measure °Brix. Although refractometers are more expensive than hydrometers, they are more frequently used because they can measure over a large scale, 1–70 °Brix, and they constitute a fast method which requires very little sample, 2-3 ml. Modern refractometers can compensate for temperature, but independent correction for acids is necessary, especially for concentrates. Read more about in-line refractometer measurements in subsection 7.4.7. Total acid content (acidity) is measured by titration and is often expressed as grams of citric acid per litre juice. The ratio of sugars to acid (Brix/acid ratio) is very important for taste, as it is a measure of the balance between sweet and sour. As oranges ripen, their acidity decreases and sugars increase. Therefore, the Brix/ acid ratio will also increase. The ratio decides the maturity of the fruit before harvesting. Maturity standards for oranges in Florida require a minimum °Brix of 8.0 and a minimum Brix/ acid ratio of 9. Consumers prefer a ratio around 15 and it is thus often necessary to increase the ratio. In the US, the only permissible way of doing this is by blending low-ratio juice with juice of higher ratio extracted at other times of the season. This is also the case in the EU following amendments to legislation in 2012 to prohibit sugar addition to all fruit juices, whether imported or produced in Europe. (Previously, the addition of up to 15 g/l sugar in orange juice for balancing acidity was permitted without a requirement to label it “sweetened”.) Several other countries allow small amounts of sugar addition, but the levels vary. Local legislation should therefore be consulted for details. Adding sugar to juice is permitted in the Codex Standard but must be clearly labelled. Removal of acid from the juice – deacidification – would also increase the ratio, but many countries do not permit this for orange juice. Where it is allowed, it must be declared on the label. In the US, reduced-acid orange juice is marketed to persons with sensitive stomachs. Orange juice concentrate can be bought with different ratios – typical values lie between 14 and 17. Juice acidity is measured using a chemical titration method. Orange juice contains acids that release hydrogen ions (H+) in solution. When a base that releases hydroxyl ions (OH-) is added to an acid media, a chemical reaction takes place that gradually turns the solution neutral. To analyze the acid content in a juice sample, a base such as sodium hydroxide (NaOH) of known concentration is slowly added under agitation until a specific pH is reached. Most official methods state that the end pH should be 8.1 (AOAC*) to 8.2 (USDA). However, some producers titrate to pH 7.0 (neutral) and it is therefore important to mention the end pH together with the acid content. The change in pH can be detected by a pH electrode or by using a sensitive pH colour indicator that changes colour abruptly at pH 8.2. When the size of the juice sample, the concentration of the base and the amount of base added are known, the total concentration of acids in the juice can be calculated. In Europe, the acidity of orange juice is expressed as grams citric acid per litre juice, whereas in the USA it is expressed as grams citric acid per 100 grams juice, or % w/w. Pipette 10 ml of single-strength juice or weigh 5-10 g concentrate into a beaker. Pour sodium hydroxide (NaOH) of concentration 0.1562 N into a burette. The pH can be indicated by adding five drops of phenolphthalein or by using a pH meter. Titrate until a slight darkening in the juice persist or until pH 8.20. Read the amount of NaOH used from the burette. * AOAC Association of Official Analytical Chemists. Cloud in orange juice is considered a desirable characteristic: it gives an opaque appearance to the juice and is important for mouthfeel. Orange juice cloud forms from soluble and insoluble (suspended) compounds released during juice extraction. Pectin is an important soluble cloud constituent because it increases the viscosity of the juice liquid, thereby allowing solid particles to remain suspended. So-called “cloud loss” is caused by a loss of viscosity due to reactions between pectin molecules and calcium. In the reaction, long pectin molecule chains are formed that sink to the bottom. Cloud loss leads to total separation of suspended particles, leaving an upper clear phase and a lower cloudy phase consisting of solid matter settling towards the bottom. If the same reaction between pectin and calcium takes place in orange juice concentrate, it will instead lead to gelation of the concentrate. You can read more about this in subsection 4.4. Another important contributor to the opaque appearance of juice is the suspended solids also known as pulp. The very small pulp particles called “sinking pulp” are closely related to cloud. Some sedimentation of these particles will occur during storage. This sedimentation is not related to cloud loss. Pulp is made up mainly of ruptured fruit cell walls, segment walls and core fibre. Two kinds of pulp are found in juice. Sinking pulp, comprising particulate fibres that gradually settle out with time, is found in all orange juices and is an important part of orange juice cloud. Typical values in single-strength juice range from 5% to 12%, though the results depend very much on the analysis method used. Floating pulp, or cells, consists of larger solid matter. Most rises to the surface after the juice has been stirred. Floating pulp is added to concentrate or reconstituted juice. Its typical concentration in single-strength juice, if added, is 5-30 g/l (sieving method). More information on pulp and pulp production can be found in sections 5 and 8. Different procedures for measuring the pulp and concentration of suspended solids of orange juice are used by the industry. This often makes it impossible to compare values from different sources. The juice sample is centrifuged in graduated tubes for a known time and speed. Solid material above a certain particle size will settle in the tubes according to time and centrifugal force. The recommended procedure in the juice industry is to spin the juice sample at 370 g for 10 minutes at 26°C (USDA method). The Tetra Pak method uses 3,000 g for 3 minutes. The higher g-force used in the Tetra Pak method gives a more compact pulp sediment and therefore a significantly lower reading than the recommended method for juice of the same pulp content. Sediment amount is expressed as volume %. The time/ speed combination may vary greatly from method to method. The result may be referred to as suspended solids, suspended pulp, centrifugable pulp or sinking pulp. Floating pulp is often measured using a sieving method. Sieves with different hole sizes are used to determine pulp volume and size in juice. Particle shapes and size distribution of floating pulp can also be determined using “dynamic image analysis” (see subsection 8.2). Cloud stability is detected by measuring the transmittance of orange juice in a spectrophotometer. This analysis method uses the fact that both soluble and insoluble solids absorb light, with the result that only a certain amount of total light entering a sample will pass through it. The product streams that contain volatile flavours in a juice processing plant. The first two have already been discussed. The following text deals with the volatile components of orange juice. “Volatile” means that the compounds will vaporize from the juice at elevated temperatures. The lower the temperature at which the flavour component evaporates, the more volatile the component. As the orange ripens, volatile components form and increase. They are of two types: water-insoluble oils and water-soluble aromas. In everyday speech, volatile components are referred to as flavours. During the production of orange juice concentrate, most of the volatile flavours are removed in the evaporation step by being boiled off together with water. This gives juice concentrate a flat, cooked taste. However, the volatiles boiled off from juice are collected in an essence-recovery system and the orange flavour can later be restored by adding back the recovered fractions. Along the entire juice supply chain – from tree to consumer – processing and storage can cause the juice to lose or gain flavour compounds. It is important to extract the juice so that unwanted compounds from peel and rag do not enter the juice. This is mainly achieved by avoiding too high a pressure in the juice extractors and juice finishers (see section 5). Heat and oxygen are involved in the formation of off-flavour compounds during processing and storage. However, it is still not totally clear how the compounds that affect juice flavour are formed. The volatile flavour components are found in three product fractions – peel oil, essence oil and essence aroma. To obtain good orange juice flavour, components from all three fractions must be present. However, the exact blend needed for an optimal orange juice flavour is still unknown. Peel oil. The recommended level of peel oil in reconstituted FCOJ is about 0.02% v/v. When added to juice, peel oil gives body and freshness, though when used alone it can give an artificial taste. Oil levels much above 0.02% v/v cause juice harshness and a burning taste. Essence oil. A typical concentration of singlestrength essence oil added to orange juice from concentrate is about 0.01% v/v. When added to juice, essence oil gives top-notes and makes the juice fruity, green and sweet. Essence aroma. The essence aroma gives top-notes to the juice and makes it fresh and sweet. A typical concentration of single-strength aroma added to orange juice is about 0.2% v/v. Adding this fraction, also called waterphase essence, is more commonly done with premium quality juice products than with standard products. Adding back flavours to concentrate or reconstituted juice is done to different degrees. 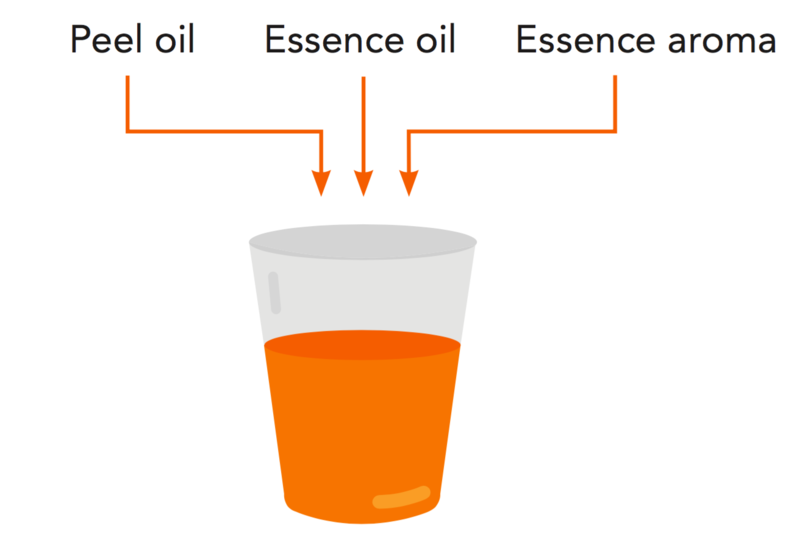 Most processors add essence oil, essence aroma and additional peel oil to develop a special taste. Today, dedicated flavour companies offer specially developed flavour packages to enhance a certain desirable flavour profile. Further details on volatile flavour fractions can be found in section 8. There is no reliable instrumental method of determining orange juice flavour objectively, so it is carried out by sensory evaluation. As this is based on subjective judgement, the setup of sensory analyses for flavour and the evaluation of results are complicated. Nevertheless, flavour analyses are necessary because of the importance of flavour as a quality parameter. Oil content is often equated to d-limonene concentration because d-limonene is the dominant compound in both peel oil and essence oil. d-Limonene acts as a carrier of flavours but contributes little to the flavour itself. However, excess d-limonene can give juice a burning taste. Juice processed under USDA directives may have a maximum oil content of 0.035% v/v. However, consumer preferences range between 0.015 and 0.020% v/v. High levels of oil in juice result from squeezing the fruit too hard when extracting the juice (for increased yield). In juice used for concentrate production, high oil levels are not regarded as a serious problem because most of the oil is boiled off in the evaporator. However, high oil levels in juice from the extractors may indicate that other unwanted compounds have entered the juice. These non-volatile flavour compounds do not leave the juice during concentration. NFC production often uses low-pressure extraction and/or downstream de-oiling of extracted juice to reduce the oil content close to 0.020% v/v. The analysis of volatile flavours is often complex and involves expensive instruments like a gas chromatograph. The d-limonene level can, however, be measured by a simpler titration process known as the Scott method. Because it is not possible to titrate the juice directly, the oil must first be removed from the juice. This is done by heating a mixture of juice and alcohol. The alcohol and oil are the most volatile components and evaporate readily from the mixture. Their vapours are cooled and collected. The d-limonene content in this mixture can then be determined by titration. Scott method titration is based on a chemical reaction between d-limonene and bromide. First a red colour indicator is added to the sample, then a bromide solution is added slowly. Bromide reacts with d-limonene, and as long as d-limonene is present in the sample the solution remains red. When the sample no longer contains any d-limonene, the bromide reacts with the colour indicator instead and the red colour disappears. As the concentration of the bromide solution and the amount added to reach the colour change are known, it is possible to calculate the d-limonene content. The oil level is expressed as % v/v in 11.8 °Brix juice. Orange juice should have no noticeable trace of bitterness. Although even very small amounts of bitter substances are detectable by the consumer, bitterness is not a common problem for orange varieties normally used for processing. Some orange varieties mainly intended for the fresh fruit market, such as Navel and Shamouti, contain a precursor (a chemical substance that gives rise to another more significant substance) of a very bitter compound called limonin. The precursor itself is not bitter, which explains why fresh fruit and freshly extracted juice of these varieties do not taste bitter. But when the juice sacs rupture during extraction, the limonin precursor enters the juice, where it is rapidly converted to limonin. The bitter taste can be removed by a debittering process that involves centrifugal separation or ultrafiltration of the juice followed by adsorption of the bitter components in the clarified liquid on to special resin. The intense colour of orange juice is mainly due to compounds called carotenoids. Colour, which should be bright yellow to orange-red and not too pale, is an important quality parameter. The fact that the USDA regards colour scores and flavour scores as equally important for orange juice shows the significance of colour. In dry, cooler climates like the Mediterranean, juice colour is well developed. In hotter and more humid climates, as in Florida, pigments are diluted and juice therefore possesses less colour. The only legal way to enhance colour is to blend the juice in question with another orange juice with a higher colour score (for instance juice from Valencia oranges). US regulations and the Codex Standard allow up to 10% tangerine juice to be added to orange juice. Tangerine juice contains more carotenoids and therefore is stronger in colour than most other citrus varieties. Colour can be measured by comparing the juice with known colour standards in glass tubes, or by using a colorimeter. Off-colours result primarily from formation of brown compounds that dull the natural colour of juice, not by changes in the pigments themselves. The colour pigments of orange juice are quite heat-stable compared to colour pigments in other foods. The formation of brown-coloured compounds occurs after excessive heat treatment or long storage at room temperature. Colour is an important quality parameter but is difficult to define and measure. The main methods for evaluating colour are presented below. An example of this subjective method is the set of USDA colour tubes. The colour of the orange juice sample is simply matched with one of six colour standards in glass tubes. The comparison should be done under a defined light intensity of around 150 candela. A colorimeter emits a flash of light from a pulsed xenon arc lamp to illuminate a juice sample and then measures the reflected light. The measured colour is then expressed according to the L, a and b colour scale. The L axis indicates colour lightness, the a axis indicates colour range from red to green, and the b axis indicates colour range from yellow to blue. A number of compounds present in juice contribute to its health-promoting image. Some of these are discussed below. Ascorbic acid – vitamin C – is the most important nutrient in orange juice. One reason for this is that consumers regard oranges as a good source of vitamin C. Some other fruits contain more vitamin C than oranges but few are as popular (see Table 2.4). The level of vitamin C in freshly extracted orange juice may vary a lot depending on orange variety and growing conditions. Typical concentrations of vitamin C in freshly extracted juice range from 450 to 600 mg/litre. Provided that the production procedures are correct, only a small loss of vitamin C occurs during the initial processing into concentrate. More significant losses may occur during processing at the juice packer and during ambient storage. Typical values for orange juice when consumed range from 200 to 400 mg/litre. Vitamin C is essential for the synthesis of collagen, the most abundant protein in mammals. Collagen is the major fibrous element of skin, bone, blood vessels and teeth. A lack of vitamin C leads to scurvy, which causes loss of teeth, bleeding skin and ulcers. Vitamin C is sometimes suggested to have an anti-cancer effect on account of its reaction with and inactivation of free radicals in the body. A wide range of other beneficial effects are also suggested. Contrary to popular belief, however, it has never been shown clinically that vitamin C has a preventive effect on the common cold. Folic acid is also found in significant amounts in orange juice. This B vitamin is required for DNA synthesis and its deficiency is first expressed in tissues with high rates of cell turnover. Pregnant women are prone to folic acid deficiency, which in rare cases may affect the foetus. Folic acid is quite heat-sensitive, but the vitamin C in citrus juice protects it from degradation during heat treatment. Flavonoids and pectin are believed to be linked to the reduction of blood serum cholesterol in humans. The flavonoid hesperidin can, however, cause problems during orange juice production as it precipitates as white flakes in the evaporator. A number of other nutrients like thiamine and potassium are also found in orange juice but not in larger amounts than found in other fruits and vegetables. A comprehensive list of nutrients in freshly extracted orange juice is given in Table 2.5. Source: adapted from Redd and Praschan. Quality parameters as defined in product specifications and grade standards provide orange juice buyers and sellers with appropriate information about the product they are handling. This applies to any link in the production chain. To the consumer, however, orange juice covers a wide range of products, many of which are not well defined. Multiple terms are used in orange juice marketing to describe the various products. Several are inconsistent and have different meanings in different countries. As global marketing of, and trade in, oranges increases, pressure is growing to harmonize the terminology. Orange juice products can be divided into two main categories: ready-to-drink juices and concentrates. The latter require dilution with water before consumption. Ready-to-drink juices are either NFC or reconstituted from concentrate. Ready-to-drink (RTD) orange juice is at the strength at which it will be consumed. It does not require dilution before drinking. Some categories of RTD orange juice are given below. Juice packaged directly after extraction but without pasteurization or any other physical or chemical treatment. Its shelf life is very short. A misleading term that should be avoided. Sometimes it is used to mean freshly squeezed orange juice; in other markets it is used for juice distributed chilled (NFC or made from concentrate). Juice that has neither undergone a concentration step nor dilution during production. This term originated in the US. European legislation and the Codex Standard define NFC simply as fruit juice. A term that has been used in the US and Canada for NFC for marketing purposes. A term sometimes used in Europe for NFC. The expression “not from concentrate” is felt to imply to consumers that juice derived from concentrate is inferior to NFC. Often used on a label to define pure juice, being a direct juice or one made from concentrate to distinguish it from nectar. This product is also known as orange juice made with concentrate. The juice is produced by diluting orange concentrate with potable water. This is juice with added floating cells (also known as pulp or fruit meat). The product is sometimes called home style or natural. The added cells provide mouthfeel and increase the juice’s natural fibre content. Juice without floating cells is referred to as “smooth”. Packers may add both naturally occurring and manmade vitamins to increase the nutritional value of orange juice. Calcium compounds, which are soluble in juice, are added to juice by the packer to increase its nutritional value. Addition of nutritional fibre (normally not from oranges) to increase the health value of juice. Juice where part of the citric acid has been removed by ion exchange during manufacturing. This is permitted in the US. The lower acidity of the juice may be milder for the gastric system when consumed. Orange juice with added sugar, acids and/or water. The minimum fruit content varies according to legislation. For orange nectar, EU regulations stipulate min. 50% fruit juice content at RTD strength. Drinks with a lower juice content than nectars. They are not subject to juice legislation but to general food legislation. In some cases, they may contain only peel oil and flavouring agents, or pulp wash concentrates. Products tasting of orange but containing no genuine juice product. Concentrated orange juice is diluted to single strength before consumption. The most common orange concentrate products for the trade and retail sectors are shown below. The standard product for traded orange juice concentrate. It is concentrated approximately 5.5 times. It is a bulk product only, stored and shipped at -6°C to -25°C. The term may be misleading as FCOJ at such high concentration does not freeze solid but is still pumpable. This product is often referred to as Dairy Pack. It is a bulk product only. It is 66 °Brix concentrate cut back (rediluted), for example with single-strength juice and pulp, to the required concentration. No further additions are needed at the juice packer apart from water dilution. Dairies commonly use this product. A retail product, mainly in the US, for dilution with water (three times) to single strength at home, in restaurants, etcetera. A retail product aseptically packaged, mainly in Scandinavia. For dilution with water (four times) to single strength at home or in restaurants. It is distributed chilled or at ambient temperature. In the European Union and several other countries, the term “orange juice” may only be used for juice extracted from sweet oranges, Citrus sinensis. In the US, “orange juice” may come also from the Ambersweet orange, a crossbreed between sweet orange, tangerine and grapefruit that was developed to enhance the colour and taste of juice blends with other early varieties. US regulations allow also for up to 10% of tangerine or hybrid orange/tangerine juice to be included in orange juice. Likewise, the Codex Standard allows for 10% mandarin juice inclusion. These added juices can improve the colour and flavour of the blended juice. In general, regulations governing direct juice, or NFC, allow for flavour and pulp added back to the juice to come from the same fruit species and not necessarily from the same juice batch. For reconstituted orange juice, water should be added to the minimum concentration defined in the national quality standard. Adding back essences helps restore flavours. Pulp can also be added to achieve the desired properties of the final juice product. Orange juice should come from the endocarp of the fruit and be extracted by mechanical means. The 2001 EU fruit juice directives allow pulp wash in orange juice from concentrate, but not in direct (NFC) juice. This is in line with regulations in the US and many other countries, as well as the Codex Standard. In the US, standards governing the composition and labelling of food and the use of additives fall under the administration of the Food and Drug Administration (FDA) and the United States Department of Agriculture (USDA). The FDA enforces standards for orange juice identity (or juice origin) and the USDA enforces standards for orange juice grades (more or less quality). In the EU, legislation covering fruit juices and fruit nectars is based on a Council Directive on fruit juices and similar products. The current directive 2001/112/EC came into force in 2001 and EU countries were given until 2003 to comply with it. The directive has since been revised four times. The most recent amendment, in 2012, prohibits the addition of sugar to fruit juices and brings the labelling requirements into line with the 2000/13/EC labelling directive. Legislation in other regions resembles that of the US and EU. Countries that do not have national legislation refer to the Codex Alimentarius published by the FAO. The current Codex general standard for fruit juices and nectars was issued in 2005 (CODEX STAN 247-2005). There is a general desire worldwide to harmonize orange juice standards to promote free and open global trading. This is an objective of international trade organizations such as the Juice Products Association (JPA), whose members come from the US, Latin America and China. An overview of the key legislative requirements in the US, EU and other countries can be found in section 11, Standards and Regulations.